The sinuses are air-filled spaces within the face and head. The lining of the nasal cavities and sinuses produces mucous. There are eight sinus cavities altogether. If the system works well, the nasal airway functions efficiently even in the presence of an upper respiratory tract infection. If the outlet tracts are blocked, mucociliary flow is impaired and symptoms prevail. Blocked nose, facial pressure, persistent post-nasal drip and decreased sense of smell and taste are some of the presenting symptoms experienced by patients with 'sinus' problems. These symptoms may occur on their own or in conjunction with a history of allergy. Some of these patients may have co-existing illnesses like asthma and may be quite unwell on presentation. A combination of a fibreoptic nasendoscope and CT scan of the sinuses is required as part of the examination and investigation for accurate diagnosis and management plan. Endoscopic sinus surgery may be done for either medical or surgical conditions. Examples of these are episodes of recurrent acute sinus infections which present with the above symptoms in conjunction with fever. Each episode may resolve with optimised medical treatment but if frequency and longevity are present with time off work, surgery is an option. The other main example is that of bilateral nasal polyposis. Again after optimisation of medical treatment, if nasal obstruction persists and especially in the case of asthmatics if asthma control is becoming difficult, surgery is an option to control the airway. Examples of these are nasal tumours, unilateral nasal polyps (polyps on one side of the nose only). The outflow tracts of the sinuses are opened to enable drainage and ventilation of the sinuses. This is done through the nose and fibreoptic telescopes are used. 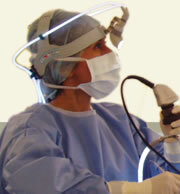 The image is magnified by the use of a monitor and this allows precise application of the instruments. The actual sinuses that have to be targeted would have been previously decided during the consultation. A septoplasty may need to be done first to gain access to the sinuses and to remove any other pathology. It is done as a day surgery procedure and a general anaesthetic is required. The procedure, risks and benefits will be discussed in full during your consultation with Dr Para.